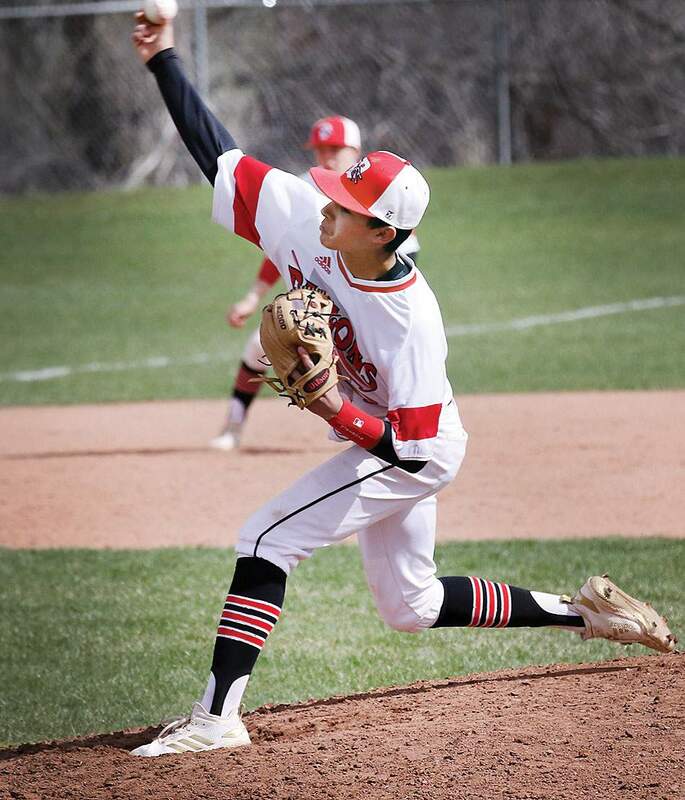 Gage Mestas of Durango High School struck out 16 Glenwood Springs batters and allowed only one hit and one walk in a 4-0 win Friday at Walden Memorial Field on the DHS campus. 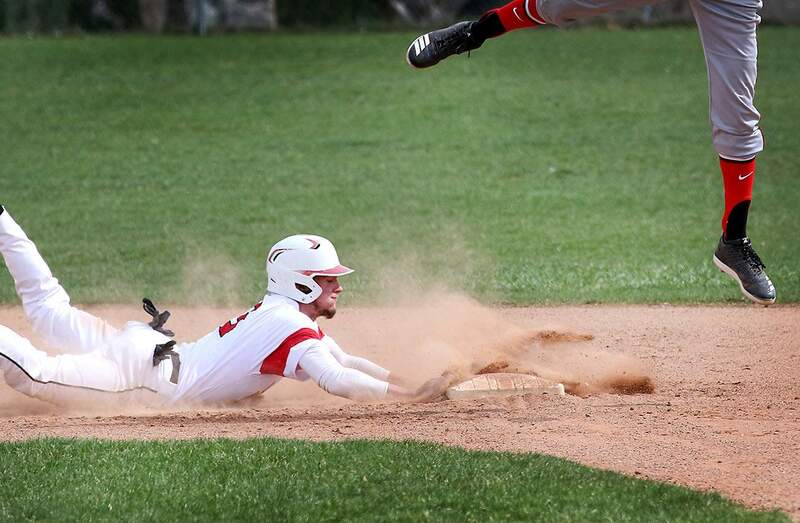 Dawson Marcum of Durango High School slides back safe to second base after a high throw while playing Glenwood Springs High School on Friday at DHS. Cal Walsh of Durango High School waits to tag out a Glenwood Springs High School base runner at second base on Friday at DHS. Walsh had a big day at the plate with a three-run homer in Game 1 and a three-run double in Game 2. The Durango High School baseball team locked in for Game 2 of a doubleheader against Glenwood Springs after losing 8-6 in Game 1. Former Durango Herald sportswriter Joe Fries led the Glenwood Springs Demons on Friday at Durango High School. 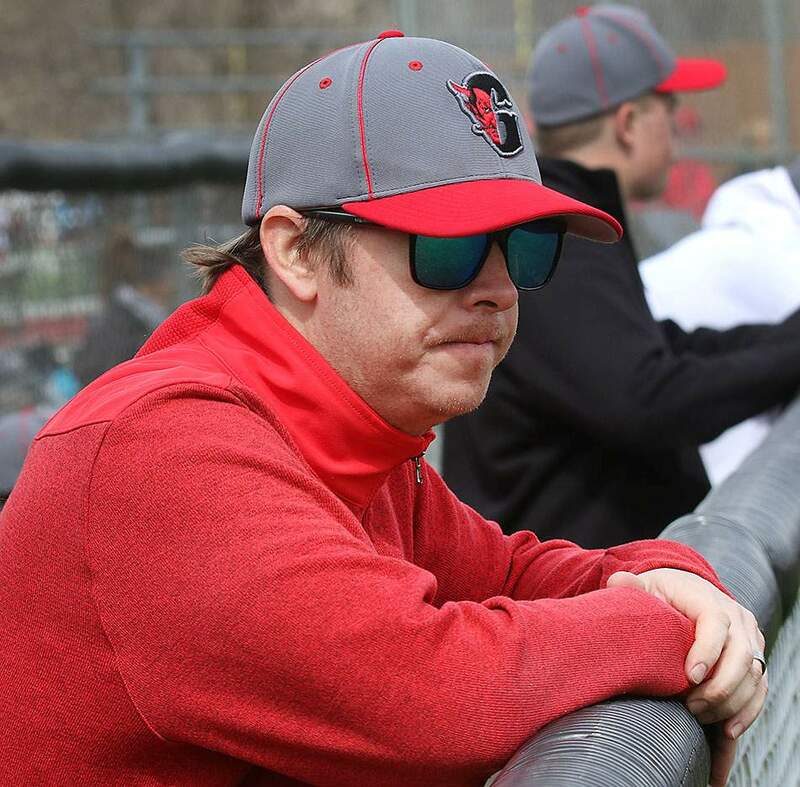 The varsity pitching coach took over for the doubleheader after the Glenwood head coach Eric Nieslanik was ejected in the first inning of Game 1. 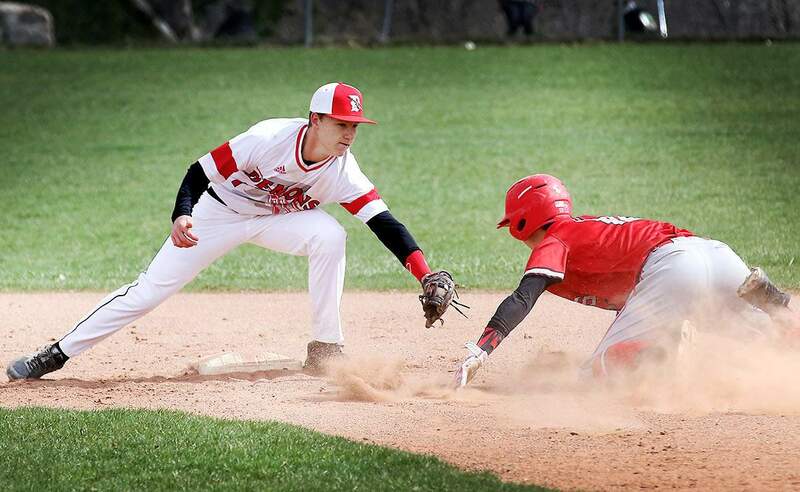 The Durango High School baseball team wasn’t happy to see Glenwood Springs score five runs in the top of the seventh inning to come from behind and win the first game of a doubleheader 8-6 on Friday. DHS sophomore pitcher Gage Mestas took it upon himself to not let it happen again in Game 2. Mestas threw a seven-inning shutout in which he struck out 16 batters. He allowed only three base runners all game. His no-hitter was broken up with two outs in the sixth inning on a hard-hit groundball from Sebastian Gonzalez that got through the hole between shortstop and third base past the diving attempt of Durango third baseman Elias Fiddler. 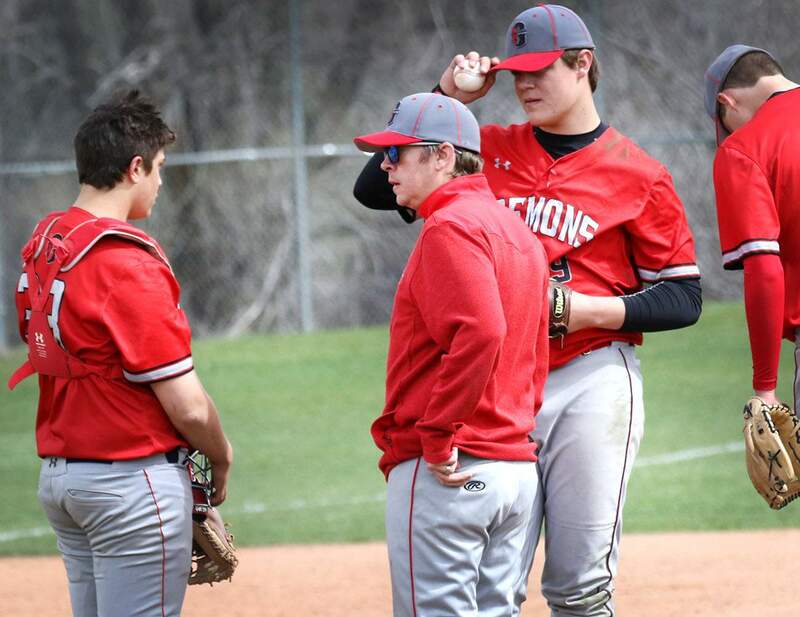 After the single, Mestas struck out three of the final four Glenwood Springs batters of the game to help send DHS to a 4-0 win to split the home doubleheader. Mestas had struggled with his curveball and changeup early in the season, but it began to click a week earlier in a 5-1 home win against Kirtland Central, as he struck out nine and allowed only four hits and one run in five innings. Friday, Mestas was even better, and he made the Glenwood Springs batters guess at every pitch by mixing up his offerings. Former Durango Herald sportswriter Joe Fries is now the pitching coach at Glenwood Springs. He is seen here in a mound visit with pitcher Cole Houston and catcher Kai Kanzer. The first Glenwood Springs batter reached in the top of the fourth inning, as Dylan Lee got on base when a fly ball was dropped in shallow center field. Mestas would pick Lee off, as he tried to steal second base early and Mestas was able to step off the mound and throw him out at second base. Mestas issued a walk to Garrett Dollahan in the fifth inning. Mestas got ahead in the count 1-2, but an umpire called time after a foul ball to observe the national anthem being played at the adjacent stadium before the Durango boys lacrosse team played Montrose. Mestas thought he had a strikeout with a 2-2 fastball that was called a ball, and he eventually walked to Glenwood Springs hitter. Mestas struck out the next batter to strike out the side. He then struck out the first two Glenwood batters in the sixth before Gonzalez’s single broke up his no-hitter. Durango took a 1-0 lead in the bottom of the third inning without recording a hit. Niko Mestas led off the inning with a walk and reached third after Gage Mestas was hit by a pitch and Dawson Marcum drew a walk. Niko Mestas would score on a wild pitch. 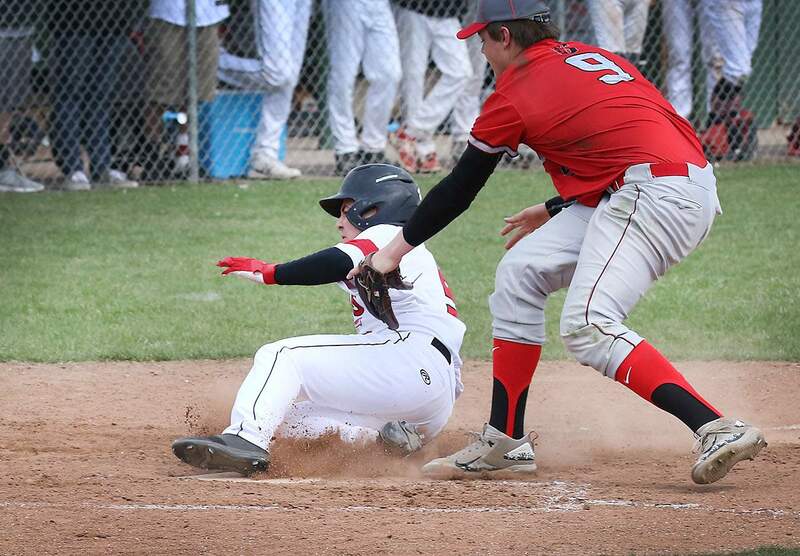 Niko Mestas of Durango High School slid safely into home on a wild pitch to score Durango’s first run in the third inning Friday in Game 2 against Glenwood Springs. Durango plated three runs in the fourth on a three-run double off the bat of Cal Walsh that scored Fynn Hyson, Gage Mestas and Marcum. It was a big hit for Walsh, who also had a three-run home run in the bottom of the first inning in Game 1. Gage Mestas was 3-for-4 at the plate in Game 1, but the Demons didn’t do much after a four-run first inning powered by Walsh’s homer. Hyson pitched a solid game in the opener, but five walks cut into his pitch count. Hyson threw 5 2/3 innings and allowed four hits and struck out six, but he walked five. Al Hurworth came on in relief and was tagged for the big five-run seventh by Glenwood Springs. Both teams will begin league play next week, and Fries said getting to see Mestas on the mound will have his team more prepared for league.